South Australia is one of the world's richest Ediacaran fossil localities. Fossils are found in a rock unit called the Ediacara Member throughout the Flinders Ranges, most notably at Ediacara Conservation Park, where the first discoveries were made, and at the remarkable site at Nilpena, where serial excavations have unearthed a wealth of palaeoecological and palaeontological information. The Ediacaran fossil sites lie within the Cryogenian to Cambrian sedimentary sequence of the Adelaide Geosyncline (cf. Sprigg, 1952; see Gehling & Droser 2012 for a concise recent summary of the geology of this region). Late Cryogenian tillites of the Elatina Formation (a Marinoan glacial equivalent) are capped by a mixed carbonate and siliciclastic succession of the Wilpena Group. Rare Ediacaran fossils can be found in the Wonoka Formation (such as Palaeopascichnus; Haines, 2000), but the most spectacular occurrences occur within the Ediacara Member of the Rawnsley Quartzite. Due to a lack of suitable lithologies, there has been little in the way of radiometric dating of the Australian succession. The Ediacara Member is considered to be a shallow-marine to deltaic succession, with fossils found in sandstone facies reflecting fair-weather to storm-wave-base depths (Gehling & Droser, 2012). There are several distinct facies within the Ediacara Member, and these contain varied fossil assemblages (Gehling & Droser, 2013). The formal boundary for the base of the Ediacaran Period (the basal Ediacaran Global Stratotype Section and Point; GSSP) can be found within the Flinders Ranges National Park, at Enorama Creek. The GSSP is located at the base of the cap carbonate immediately above the Elatina glacial horizon, and is lithostratigraphically correlated to rocks elsewhere that have been dated to ~635 million years in age. The basal Ediacaran GSSP, Enorama Creek, South Australia. The GSSP sits above the purple diamictite of the Elatina Formation, at the base of the cap carbonate Nuccaleena Formation. The Flinders Ranges National Park is located in the central Flinders Ranges, ~450 km north of Adelaide, in South Australia. It falls under the jurisdiction of the Department of Natural Areas and Resources, Government of South Australia. The Park covers an area of 912 km. sq., and incorporates several Ediacaran fossil localities. Most of these lie within the Heysen Range, a 50 km long extension of the Wilpena Pound synform, and include Bath Tub Gorge, Parachilna Gorge, Brachina Gorge, Bunyeroo Gorge, Enorama Creek, and Wilpena. Enorama Creek, a site within the National Park, contains the GSSP for the base of the Ediacaran Period – the type locality at which the level is defined (Knoll et al., 2004, 2006). Brachina Gorge (discovered in 1968) is renowned for the richness of its fossil surfaces (see Fedonkin et al., 2007), and has an informative 20km geological trail that can be followed by tourists. Emu Gap, near Wilkawillina Gorge, possesses fossils from the Trezona Fm. of pre-Ediacaran age that have been speculated to record early sponges (Maloof et al., 2010). The area possesses relatively high taxonomic diversity, but many additional as yet undescribed taxa remain to be formally named. Evidence for a mid-Ediacaran meteorite impact, the Acraman ejecta layer, can also be found in this area. 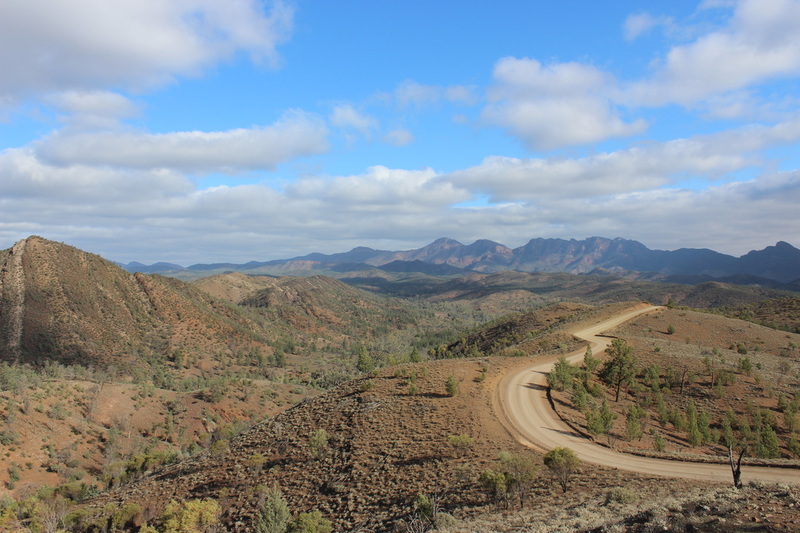 The view from the Razorback Lookout, Brachina Trail, looking SW towards the ABC Ranges and Wilpena Pound, taking in the entire Cryogenian to upper Ediacaran sedimentary sequence from the Trezona Fm. at left, to the Rawnsley Quartzite (tips of the hills in the far distance). This site, proclaimed as a State Conservation Park in 2007, is a protected area to the NW of the central Flinders Ranges, ~500 km north of Adelaide and 35 km north of Parachilna. It is managed by the State’s Department of Environment and Natural Resources. Ediacara Conservation Park covers an area of 2,224 hectares, and is dominated by semi-arid scrubland and low woodland. Since the initial fossil discoveries in 1946 (Sprigg, 1947), many specimens have been collected and are housed in the South Australia Museum in Adelaide (which has an excellent public gallery on the Ediacara biota). Subsequent problems with illegal collecting activities (described in Gehling et al., 2012) have severely impacted the site. The Ediacara Conservation Park contains a sub-set of the geological units found within the Flinders Ranges National Park. 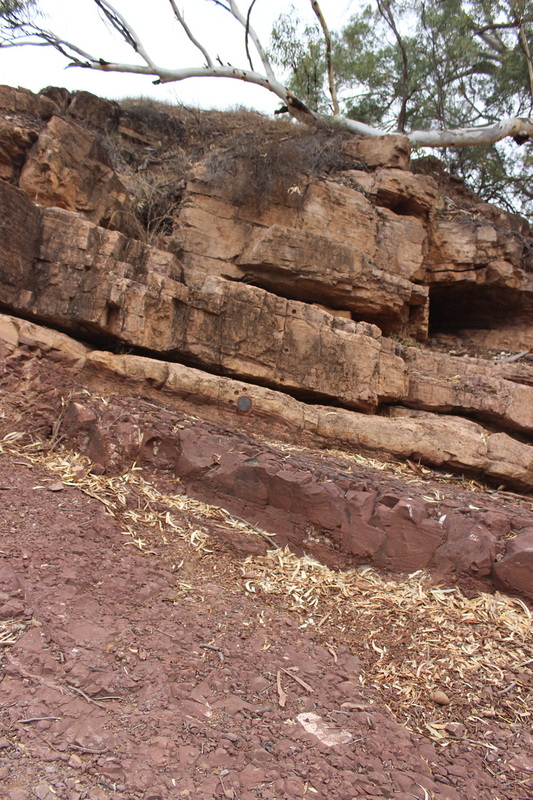 At Ediacara, the Bonney Sandstone and Rawnsley Quartzite of the Upper Wilpena Group are overlain unconformably by the Cambrian Parachilna Formation. The Rawnsley Quartzite at Ediacara Conservation Park averages around 50 m in thickness, but the Ediacara Member disconformably infills channels cut into the Chace Quartzite beneath, and therefore varies in thickness between 30–120 m, also being repeated by local faulting (Gehling et al., 2012). Ediacara Conservation Park is the site of the first discoveries of Ediacaran macrofossils in Australia (Sprigg, 1947; Glaessner, 1984), and provided the name from which the Ediacaran Period is derived (Knoll et al., 2004, 2006; Jenkins, 2007). It is also the type locality for many key Ediacaran fossil genera (e.g. Praecambridium, Spriggina, Dickinsonia, Parvancorina, Kimberella, Tribrachidium and Rugoconites). The site additionally protects features important to Australian mining history, and encompasses habitat that is beneficial to several endangered bird species. This site lies on the western margins of the Flinders Ranges of South Australia, about 25 km to the northwest of Parachilna. The property is an 800 km. sq. station (i.e., a ranch/farm), and is privately owned. The site was added to the Australian National Heritage List in 2007. The Ediacara Member is seen to crop out in over twenty different localities over a small area of ~4 x 1 km at the site (Gehling et al., 2012). The thickness of the Ediacara Member is highly variable at Nilpena, with the unit filling channels and canyons up to ~320 m thick, cut into the underlying Rawnsley Quartzite and the Bonney Sandstone. Beautiful microbial mat fabrics can be found on rippled surfaces higher in the succession. Nilpena is one of the world’s most striking Ediacaran fossil localities, with multiple bedding surfaces excavated and re-constituted on the hillsides, each covered in hundreds of well-preserved impressions of the Ediacara biota. Helminthoidichnites trace fossils can be found alongside the macrofossils (Jenkins & Nedin, 2007), but the site is becoming widely regarded for the palaeoecological insights it can reveal, since the excavation methods used by researchers here permit multiple large bedding planes to be studied, and ecological patterns to be mapped out (e.g. Gehling et al., 2012). Evidence for movement by classic members of the Ediacara biota (e.g. Kimberella and Dickinsonia) has been discovered at Nilpena (Gehling et al., 2005, 2014), as have observations relevant to their reproductive strategies (Droser & Gehling 2009). Recent discoveries include tubular body fossils (Funisia, Somatohelix), organisms that potentially live within the sediment (Nilpenia), and three-dimensionally preserved fossils. Nilpena also featured in the 2010 television series First Life. Gehling, J. G., Droser, M. L., Jensen, S. R. & Runnegar, B.N. 2005. Ediacaran organisms: relating form and function. In Evolving Form and Function: Fossils and Development: Proceedings of a symposium honoring Adolf Seilacher for his contributions to paleontology, in celebration of his 80th birthday. Briggs, D.E.G., ed. New Haven; Peabody Museum of Natural History, Yale University. pp. 43-67. Gehling, J.G., Jago, J.B. & Paterson, J.R. 2012. Ediacaran-Cambrian of South Australia / field trip leaders and authors: J.G. Gehling, J.B. Jago, J.R. Paterson; with contributions by: G.A. Brock, M.L. Droser. Geological Society of Australia, South Australian Division, Adelaide. Fedonkin, M.A., Gehling, J.G., Grey, K., Narbonne, G.M., & Vickers-Rich, P. 2007. The Rise of Animals. The Johns Hopkins University Press, Maryland. Glaessner, M.F. 1984. The Dawn of Animal Life: a Biohistorical Study. Cambridge University Press, Cambridge.